Vermeer's 'Woman In Blue' Brings Her Mystery, Allure To L.A. 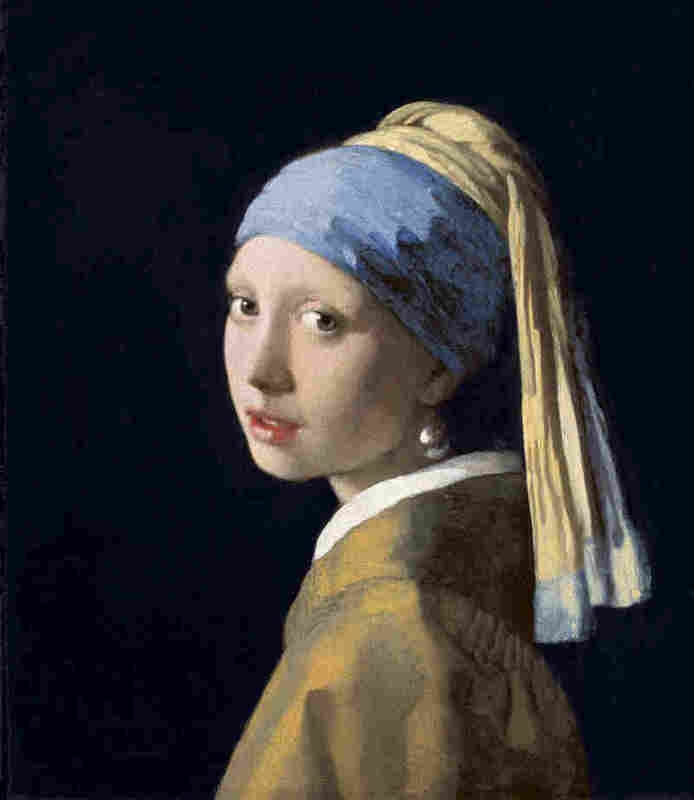 The subject of Johannes Vermeer's painting could be the Girl With a Pearl Earring's slightly older aunt. She's less innocent, more serious and currently on display at the Getty Museum in Los Angeles, her first-ever appearance on the West Coast. Vermeer's 'Woman In Blue' Brings Her Mystery, Allure To L.A.
Johannes Vermeer's Girl With a Pearl Earring is easy to fall in love with — she's young, dewy, beautiful (Scarlett Johansson played her in the 2003 movie about the painting), and she looks right at you. But the 17th-century Dutch master's Woman in Blue Reading a Letter is different — her face is shadowed and she stands in profile, totally absorbed in her letter. Pieter Roelofs recently accompanied Woman in Blue from the Rijksmuseum in Amsterdam to the Getty Museum in Los Angeles, where she's on display until March 31, her first-ever appearance on the West Coast. Roelofs, the Rijksmuseum's curator for 17th-century Dutch painting, smilingly says he always dresses to match the painting he'll be discussing: Today he sports a deep-blue shirt and sky-blue tie. 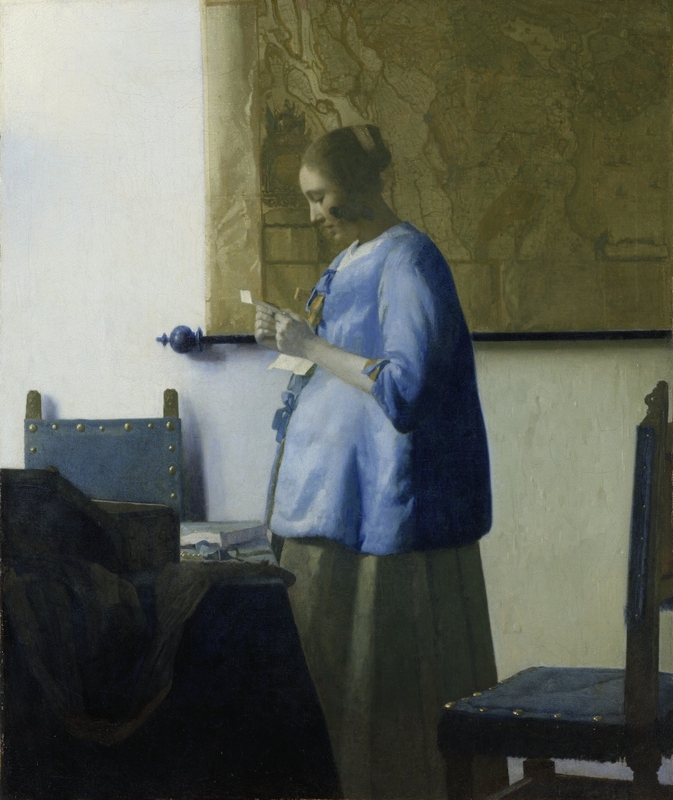 Vermeer's Woman in Blue, meanwhile, wears a short, full-cut blue jacket with a lustrous sheen that could be satin. The painter used different shades of blue to contour the jacket, which is pale and almost neon in front as she faces a window, and darkly shadowed in back. Vermeer made his beautiful blue — "celestial blue," as Vincent van Gogh called it — with lapis lazuli stones. "They imported it from Afghanistan," Roelofs says, "already in the 17th century." Woman in Blue could be Girl With a Pearl Earring's slightly older aunt — less innocent, more serious. Her mouth is slightly open; her head bends forward a bit. "It's really her and this piece of paper sent by someone, expressing a message that we do not know," Roelofs says. "We are part of the story, but we shouldn't be there, probably, and this is lovely. I think that Vermeer — he's a master in creating these kind of connections between a person being depicted and us ... the beholders. And I think even after 350 years it still has these same kind of artistic qualities and power to involve us and make us part of the story." But Vermeer is only telling a bit of the story. Anne Woollett, Getty's curator of paintings, says there are still so many questions: We don't know who the lady is; we don't know who wrote the letter. "We don't really know what she's reading, whether she's re-reading a letter that came out of the box that's at the lower left, whether she's reading something that's just arrived," Woollett says. "Perhaps she was sitting on the chair on the right and she stood up to read something important. It's all very alluring." The Getty's website is inviting visitors to imagine the letter's first line. A professional writer will pick one submission, then create the rest of the message. Given how intent the woman looks, along with those parted lips, it just might be a love letter, penned in a distant place — at sea, maybe — and carefully composed. In those days in Holland, good communication was highly valued. "There were manuals from France which gave some guidance about how to write to someone," Woollett says, "how to write those important thoughts and feelings in an elegant way." If there'd been e-mail in the 1600s, this intimate picture may never have been painted. Though Vermeer was awfully good at creating instant, if enigmatic, messages; you "get" the scene quickly. But there was nothing instant about how Vermeer worked. In his brief 43 years, he created maybe 50 paintings, about 35 of which are now known. According to Dutch curator Pieter Roelofs, "It's still possible that you will find a Vermeer painting [in] your attic."